I have written in the past about the Imperial Palace but I have almost always neglected to visit the East Gardens. The East Gardens are a free area of the Imperial Palace that is home to one of the most beautiful gardens in Tokyo. 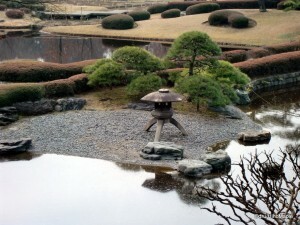 Being a free garden makes it more special as there are few if any gardens in Japan that are open to the public. The East Gardens are situated on the north east corner of the palace grounds. It can be a little difficult to find at first as most people will head to the main palace, or the Kokyogaien, the southern park. There are three entrances to the East Gardens, but most people will use the main Otemon gate. It is easily accessible from Tokyo Station or Otemachi Station. 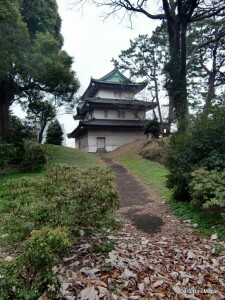 Upon entry into the gardens from Otemon gate, you will be within the Sannomaru grounds. When visiting a Japanese castle, or former castle, they have “marus”. A maru is literally translated into circle, but for a castle, it can be roughly translated into an area or section. Each section is fortified by walls and defences. Think of a traditional European castle with an outer and inner wall. This is no different except traditionally there is no ring, but rather areas. The Sannomaru area is not a very interesting place, to be honest, but it is a typical tourist “entrance”. You will pass a small entrance where you must grab a tab. This is mainly to keep track of who is inside the park, especially when closing. You must return this as you leave. Don’t worry about having to pay for anything as everything is free. Once inside, there is a small museum and souvenir shop within the Sannomaru area. The Sannomaru Shozokan is a museum housing works from the Imperial Collection. The collection is rotated to display various items that were gifted, donated, or inherited by the Imperial Family. You can see various works of art within this very small museum. It is actually just one room with various works of art inside. The souvenir shop is equally as small offering very simple gifts such as chopsticks and a few books about Japan. Calendars of the Imperial Family are also available, however making use of the building as a rest stop is a good idea. On the self guided tour, you are supposed to head up to the Honmaru area first. This is the largest area and home of the old Edo Castle when it was standing. I found the garden in this area to be somewhat sparse compared to the Ninomaru area, but the historical importance of this area is much higher. You can see various remnants of the old castle along with a little information of what they were used for. Sticking to the centre of the garden will take you to various planted gardens. The centre of attention for this area has to be the Oshibafu. 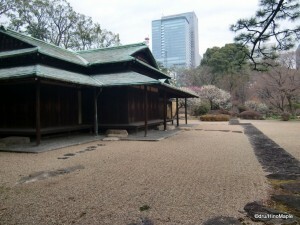 It is a large grass lawn that is used for Imperial ceremonies at times. In reality, I found it to be a bit boring and stuck to the outer circle where you can see more trees and plant life. The Honmaru area is filled with various fruit trees, rose bushes, and bamboo groves. Aside from the plant life, the Tenshudai is the main artificial focal point. It is the remaining foundation of the old Edo Castle before it was destroyed. It is used more as a viewing platform these days but the view is only of the Honmaru area itself. If you are expecting a nice view of the surrounding area, you will be disappointed. There is also the Tokagakudo Concert Hall. It is a tall concert hall with various pieces of art on the sides that depict the different seasons of the year. It is one of the most beautiful buildings in the gardens, but keep in mind that it is a modern styled building. The other buildings are all traditional buildings that have a lot of history, such as barracks for soldiers. You can’t really compare old and new things in terms of beauty. The Ninomaru area is the most beautiful area of the garden. This is where you will see the most life. If you approach the area from the back of the Honmaru area, not from the Otemon entrance, you will be delighted with a view of either the Ninomaru area or plum trees. The Bairin-zaka Slope, or plum grove slope, is absolutely beautiful during the plum blossom season (March). You can see two varieties of plum blossoms, both light and vibrant pink. They are very similar to cherry blossoms and provide an early taste for the famous cherry blossom season. The Suwano-chaya Tea House and Ninomaru Garden are located near the plum tree grove and are, in my opinion, the focal point of the Ninomaru area. The Tea House is not open to the public but it is a traditional looking tea house. The surrounding trees make this a very picturesque area. To one side of the tea house is a small section of trees. There are 47 different trees with each tree representing a different prefecture in Japan. The Ninomaru Garden is another beautiful area with a medium sized coy pond and a small waterfall. You can climb up a small embankment to the top of the waterfall where you will get great views of the Ninomaru gardens. The Ninomaru Gardens are a great place to relax in the afternoon. You may not be able to find a nice place to sit, but you will definitely find it peaceful. The East Gardens are a pleasant surprise for me. I was expecting it to be a little boring and to be honest 5 years ago I would have found it boring. 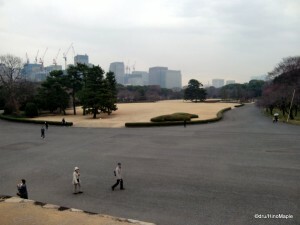 While the rest of the Imperial Palace grounds are nothing to get excited about the East Gardens is a small exception. It’s a great place to spend a few hours enjoying the nature Japan has to offer. It offers a wide variety of plant life that you would see if you toured all over Japan. You can also get a small taste of what a traditional Japanese garden will look like. Of course each garden in Japan is different but this garden is not extremely different compared to others in Japan. It isn’t very traditional, and the landscape is set within the castle grounds itself. The plants are more “modern” compared to a traditional Japanese garden, but you will still get a better feel of a Japanese garden at no cost to yourself, aside for the time it takes to tour the area. It’s definitely a good place to visit if you have the time. This entry was posted in Tokyo and tagged Bairin-zaka Slope, Chiyoda-ku, Chuo-ku, East Garden, East Gardens, Edo Castle, garden, Imperial Family, Imperial Palace, Imperial Palace East Garden, Imperial Palace East Gardens, japan, Japanese garden, Kokyogaien, Oshibafu, Otemachi, Otemachi Station, Sannomaru Shozokan, Suwano-chaya, Suwano-chaya Tea House, tea house, Tokagakudo, Tokagakudo Concert Hall, tokyo, Tokyo Castle, Tokyo Station by Dru. Bookmark the permalink.